I thought it might be appropriate to continue the maple theme I introduced in the previous blog post, as their leafy canopies are no less welcome in August than in July. There are certainly plenty of Acer species left to talk about. In any case, maples are good foils for the showier flowering plants such as hydrangeas, kirengeshomas and asters that bloom in August, as well as the early fruits of cotoneasters, roses, mountain ashes and meliosmas. By far, the largest group of maples in the Botanical Garden collection is in the Palmata group, technically, Acer Section Palmata. These are all species closely related to the common Japanese maple, whose leaves, like those of other familiar maples, are mostly palmately lobed (i.e., with lobes radiating outward like the fingers of your hand). They are sometimes also known as the fork-branched maples, as new spring growth typically arises from a pair of buds at the tip of the previous year’s shoots. In total, there are about one hundred and thirty accessions (separate plantings of different collections) of the Palmata group in UBC Botanical Garden. These represent nearly forty different kinds of maples. Compared with local display-type gardens, our collection of common Japanese maple, Acer palmatum, is somewhat meager—our mandate is to collect plants of wild origin, not cultivated plants—but we still have a have quite a few selected cultivars. Our specimen of A. palmatum ‘Osakazuki’, a cultivar celebrated for its broad leaves and scarlet samaras (keys), and especially its reliably spectacular scarlet fall colour, was planted in 1972 (near Upper Asian Way and Henry Trail) and is now over 10 m tall. It came to us originally from Ed Lohbrunner’s nursery in Victoria (along with hundreds of other outstanding plants). Speaking of which, there are a number of wonderful A. palmatum cultivars in the Asian section of the E.H. Lohbrunner Alpine Garden. Standouts include ‘Shin-deshojo’, which has startlingly bright magenta pink new growth in spring, and ‘Seiryu’, an upright-growing, green, finely dissected leaf cultivar that turns yellow and crimson in autumn. A more unusual Japanese maple cultivar is ‘Aoyagi’, which is noted for its remarkable pea-green stems (the name means “green coral”). The tree is located on a shaded trail, just off Lower Asian Way in the David C. Lam Asian Garden, but its sprawling branches are partially obscured by the wandering trunk of a small bigleaf maple and sheets of old ropy Clematis montana stems. Very spooky. An array of A. palmatum plants from the Lohbrunner nursery are located throughout the Asian Garden. The majority are un-named seedlings of A. palmatum subsp. matsumurae—in the wild in Japan, this subspecies is recognized by a shrubby, wide-spreading crown and deeply divided, seven-lobed leaves. At nearly fifty years old, these are all now sizeable trees that colour beautifully in shades of yellow, orange and red in the autumn. There are also younger plants of A. palmatum subsp. palmatum from wild-collected seed in the garden. This subspecies—the “typical” form of the species—has more upright growth and small, five- to seven-lobed leaves, the lobes cut usually about two-thirds of the way to the base. These trees are scattered about in the Asian Garden, but there is an obvious grouping below Lower Asian Way at the Service Road to Old Marine Drive. Wilson Glade (where Wilson Trail meets Lower Asian Way), has a fine collection of Palmata Group maples. Here, you can see a particularly good specimen of A. palmatum subsp. 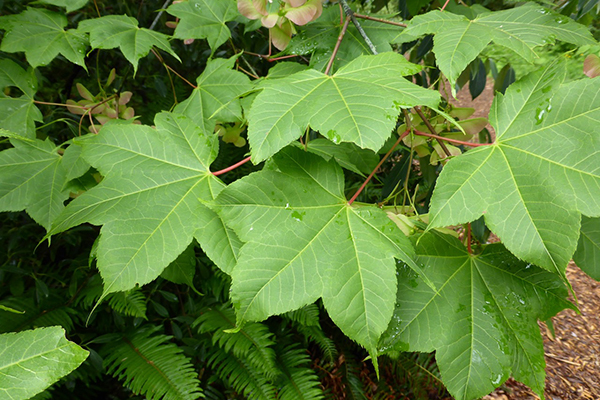 matsumurae (on the lower side of the Glade, on Lower Asian Way), the elegant, tiny-leaved A. pauciflorum, the distinctive, horizontal-branched A. shirasawanum ‘Palmatifolium’, and A. sieboldianum, with its picture-perfect form and diminutive, star-like leaves. On the western edge of the Glade and mostly going unnoticed by visitors, the rarely cultivated, evergreen A. laevigatum (from a seed collection made in northern Vietnam), shows off its green-blue stems and small, wavy-edged, oblong leaves. Despite the lack of lobing on these leaves, this species can be identified as a true Palmata by its fork-branched habit. Another A. shirasawanum cultivar worth noting is ‘Aureum’, commonly known as the golden full moon maple. This tree is on Handel-Mazzetti Trail, directly opposite the beautifully green-barked A. davidii (Pere David’s maple) close to Upper Asian Way. Its neatly pleated, golden yellow leaves are smooth, spectacular against the dark background of conifers and rhododendrons. 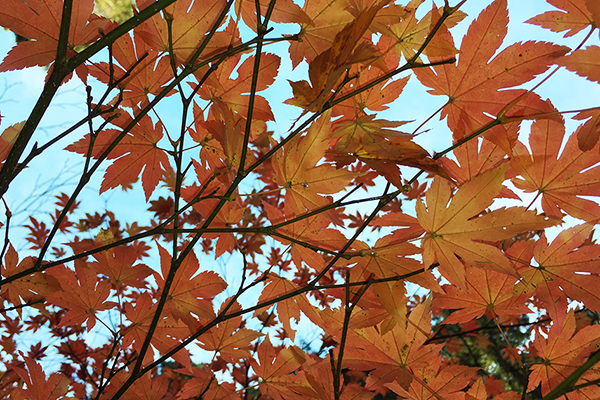 There are several A. japonicum (downy Japanese maple) cultivars in the Asian Garden. 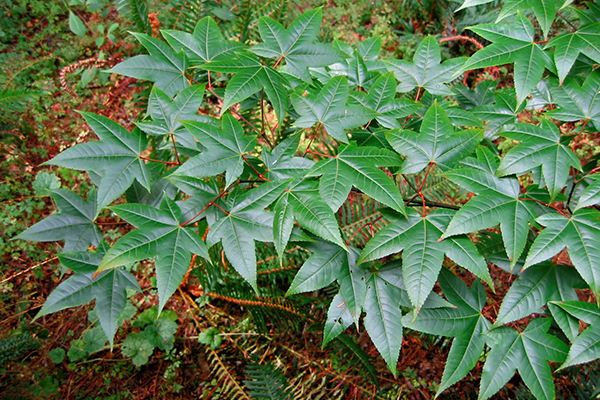 This species is definitely larger-growing with huskier stems and much larger leaves than the common Japanese maple. The leaves, stalks and new growth are also often coated in downy hairs (hence, the common name). ‘Vitifolium’ (above Sherriff Trail north of Upper Asian Way) is famous for its coarse, large (15 cm) leaves and purple, red and orange fall colour, though the cultivar most familiar to people is probably A. japonicum ‘Aconitifolium’ (Upper Asian Way west of Kingdon Ward Way), which has a dome-like habit and beautifully dissected leaves. The cultivar ‘O taki’ is a large-leaved A. japonicum that has broad lobes close-set with deep toothing. There is a large specimen on Upper Asian Way opposite the entrance to Fortune Trail. 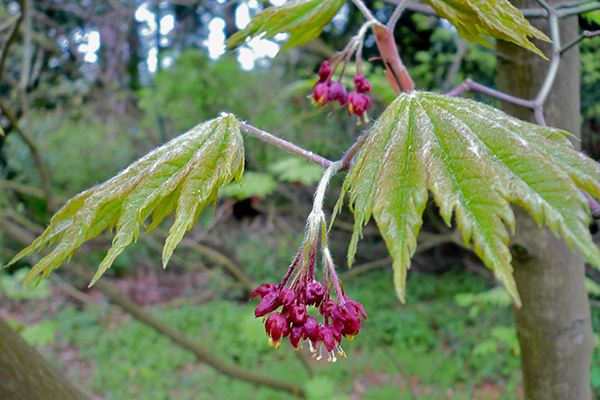 Other, less familiar Palmata species include the variable but always magnificent Acer campbellii and its relatives. These are generally placed in a subgroup of Section Palmata (i.e., Subsection Sinesia) that includes Chinese, Indochinese and Himalayan species (none from Japan or North America). There is a beautiful, 10 m-tall specimen of A. campbellii (grown from a Bhutanese seed collection) at the southern terminus of Forrest Trail at Lower Asian Way. Another, a Peter Wharton seed collection from Guizhou, China sits at the corner of Kingdon Ward Way and Upper Asian Way. In the mountains of northern Vietnam, A. campbellii produces leaves that are often purple- or bronze-backed. There is a young specimen from seed collected on Fansipan (the second highest peak in SE Asia) on Decaisne Trail below Lower Asian Way. Look for the smaller, sister species, A. sinense across the pond from the entrance boardwalk (it has a dense, oval-head). The Taiwanese A. serrulatum has blue-green bark, slender, elegant branches and star-shaped leaves, and the closely related, Chinese, A. oliverianum (north of Stearn and Siebold Trails) is renowned for its startling, pumpkin-orange autumn colour. The small three-lobed leaves of A. tutcheri (on Decaisne Trail west of Lower Asian Way) are unlike those of any other species, but in youth, the leaves are even more distinctive, having five long, coarsely serrated slender lobes (there is an immature tree on Purdom Trail at Wharton Trail). Acer erianthum (Rock Trail north of Siebold Trail) produces leaves that could be taken for those of A. oliverianum, but the white flowers are borne on strongly upright, hairy, candle-like stalks rather than in the loose, drooping clusters that are more characteristic of the group. Similar in leaf shape to A. erianthum, but with normal (drooping) flower clusters is the aptly-named A. robustum, a beautiful, slender-branched species that grows at a prodigious rate. One of my favourites (they’re all favourites—who am I kidding?) is A. pubinerve, a smallish, spreading tree that grows not unlike A. palmatum, but with sturdier olive-green stems and glossy, five-lobed leaves that unfold an oily, chocolate brown in spring. The only non-Asian member of the Palmata group is our native Acer circinatum (vine maple), which is not only exceedingly attractive, but perfectly adapted to the climate and soils here in the Botanical Garden. You’ll find several specimens in the BC Rainforest Garden, including an elegant cutleaf version known as ‘Monroe’, a witches broom (dwarf) mutation known as ‘Little Gem’ in the Alpine Garden (in North America) and a particularly fine multi-stemmed individual of the species in the Garry Oak Meadow and Woodland Garden at the base of the large A. macrophyllum. It’s worth pointing out that vine maple is not native to Vancouver Island or the Gulf Islands at all (where we find the Garry oak ecosystem in BC), and so the species is technically growing in the wrong area—that is, wrong given the current organization of the Garden. Nevertheless, this now well-established tree began its life as a spontaneous seedling, years before the development of the Garry Oak Garden. More photos can be found on our forums. I posted some not great photos of A laevigatum at http://forums.botanicalgarden.ubc.ca/threads/august-2017-in-the-garden.91411/#post-358121, but I didn’t see any samaras. I can’t answer your other questions. Would you perchance have a picture of that A. laevigatum? What colour are its samaras? Is it an evergreen worth planting here on the west coast for the average gardener with a larger property? Has it started indicating foreseeable problems, i.e. : invasiveness, struggling in our dry summers, breaking in our occasional wet snow, particular pest/disease susceptibilities?